Elizabeth Warleggen is dead! How can that be? One of the central characters in the popular TV series Poldark died during the final episode of the current series. This surely took everybody, including me, by complete surprise. For those of you who don’t watch Poldark, which takes place in Cornwell at the end of the 18th century, the beautiful Elizabeth is one of the main characters around which much of the plot revolves. Two men, Ross Poldark and George Warleggen are the rivals for her affections and, like all good stories, there have been a huge number of twists and turns determining who has the upper hand. The rivalry between Ross and George is nothing new and has been going on ever since they were at school together decades beforehand. It would be fair to say that they do not like one another and their rivalry for Elizabeth is one manifestation of their mutual hatred. Indeed, it is the war between Ross and George that is ultimately responsible for Elizabeth’s untimely and unnatural death. This is not the place to relate all the details of the complex plot. Suffice it to say that Elizabeth has become pregnant. But who is the father? Elizabeth is married to George and wants him to believe that he is the father -but she also has good reason to think that it might be Ross. Timing is everything. In order to persuade George, Elizabeth needs the baby to be born a month early. But how can she make this happen? Scrubbing floors and other traditional solutions have not worked. So, Elizabeth visits an apothecary down a dark alley in London. The apothecary gives her something in a small bottle and instructs her to take a certain number of drops to achieve her ends. He also tells her that the potion is potentially dangerous. ”If anything goes wrong -tell your doctor immediately-on no account delay!” Back in Cornwall Elizabeth takes the potion. She begins to have contractions and the baby is on the way. Hold on, something is amiss! Elizabeth starts having numerous worrying symptoms. She is lethargic and very cold. Her feet and hands go black, the signs of gangrene. She descends into a coma and dies. By coincidence similar events, also with a tragic outcome, occurred in the last episode of the TV series “Victoria”. In this case Nancy Skerrett, Queen Victoria’s maid, has married and become pregnant. She also goes to see an apothecary down a dark alley in London to get something to help with her morning sickness. It’s not clear if this is the same dark alley that Elizabeth visited but it’s probably not given the fact that this is some 50 years later-but I suppose you never know. This time the apothecary offers Nancy two bottles. One bottle is a tonic for Nancy to take if she is happy to be having the baby. The other bottle, which looks suspiciously like the one that Elizabeth purchased, is just in case Nancy really doesn’t want the “little blighter”. But Nancy wants the baby and so chooses the good tonic. What a relief that she isn’t going to die the horrible death that was Elizabeth’s fate. But no! It turns out that the good tonic is contaminated with cholera, and so she dies of that instead. Clearly being pregnant in the 18/19th century was a very risky business. As it turns out this tiny fungus is absolutely packed with potent chemicals that can have effects on the entire nervous system. As we shall discuss, in modern times some of these chemicals have been isolated and can be used to therapeutic advantage. However, in previous times, if batches of bread were prepared from ergot contaminated rye and consumed by entire villages, the result could be a mass outbreak of ergotism manifested by numerous debilitating symptoms, madness and death. This is the situation, for example, described in Barbara Comyns wonderful little novel, “Who was changed and who was dead” which describes and outbreak of ergotism in a small English village. References to the toxic effects of contaminated rye, described as “noxious pustules on ears of grain”, actually go back to Assyrian times. However, because rye wasn’t generally used by the Greeks and Romans, it wasn’t until the cereal started to be widely cultivated in Europe from the Middle Ages onward that reports of mass outbreaks of ergotism began to appear more often. Some of these were extremely serious involving mass intoxications and thousands of fatalities. Although the occurrence of ergotism has declined in modern times, it has not disappeared. As recently as 1928 an outbreak was reported in a group of over 200 immigrant Jews in Manchester, UK, following the consumption of sandwiches made with rye bread. 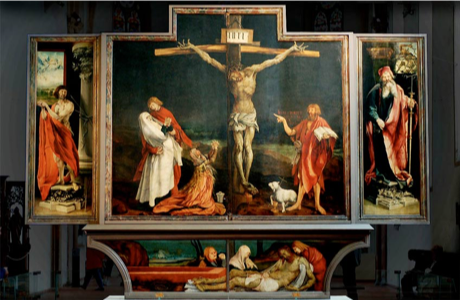 A portion of the Isenheim altarpiece by Matthias Grunewald (1512-1516) depicting the crucifixion of Christ. Historically ergotism has been divided into two types based on its predominant symptoms. The first type, “gangrenous ergotism” is associated with the symptom of St Anthony’s Fire. This is manifest by intense burning pains and gangrene of feet, hands and limbs, due to the powerful vasoconstricting properties of ergot. In severe cases, because of the loss of blood flow, affected tissues become dry and black and mummified limbs can even drop off. Indeed, in some cases several limbs can drop off from the same person. Severe cramping and spontaneous abortion also frequently occurs. The second type of syndrome is known as “convulsive ergotism”, its symptomology being more involved with the central nervous system including mania, psychosis, convulsions, headaches, nausea and vomiting. However, the differences between the two types of ergotism are not necessarily that clear and many other symptoms including gastrointestinal distress with diarrhea, parasthesias, itching and other things also frequently occur. Another symptom that is worth noting is an inability of females to produce milk. Farmers would typically guide cows away from areas where they suspected ergot had contaminated grasses so as to avoid this problem. The name St Anthony’s Fire derives from the fact that during the Middle Ages patients suffering from ergotism were often treated by monks from the ancient Order of St Anthony, which took its inspiration from the ascetic hermit St Anthony who was tormented by devils while he lived in the Egyptian desert. There are several outstanding representations of the results of St Anthony’s Fire in art. The first of these is the immense and otherworldly Isenheim altarpiece, painted by Matthias Grunewald between 1512 and 1516 for the Antonine monastery of Isenheim near Colmar in the Alsace. This great masterpiece depicts St Anthony being tormented as well as the crucifixion of Christ.The figure of Christ, and other figures in the altarpiece, clearly exhibit the symptoms of ergot poisoning. Another version of the same story was depicted by Hieronymous Bosch in his 1501 tryptich depicting St Anthony in which the ergotic themes of burning and hallucination were also well represented. Given all of the powerful effects produced by C. purpura on the victims of ergotism, one wonders if extracts of the fungus might actually be useful for therapeutic purposes if the dose was properly controlled. Indeed, just as with so many other natural products ranging from digoxin from the foxglove to salicylic acid from the willow and thousands of others, ancient folk medicine did discover uses for ergot. The major use of ergot historically was the result of its ability to produce contractions of smooth muscles, particularly the uterus and the vasculature resulting in the widespread use of ergot preparations by midwives to speed parturition (childbirth). Moreover, not only could ergot accelerate labor but it could also stem the uterine hemorrhages that sometimes occurred after delivery and were responsible for the deaths of many women . 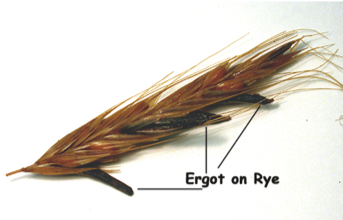 The therapeutic use of ergot for these purposes was very risky because, if the dose was too high for a particular individual, they would then exhibit the symptoms of ergotism. Nevertheless, following the start of the extensive cultivation of rye in the Middle Ages, the use of ergot by “wise women” and healers schooled in folk medicine began to spread rapidly throughout Europe and then ultimately to the USA. In 1808 John Stearns, a New York physician, published an article about ergot in the Medical Repository of New York entitled ‘An account of the pulvis parturiens, a remedy for quickening childbirth”. Moreover, the 1809 New York New York’s City Dispensary, mentioned that extracts of ergot had been used to treat amenorrhoea and for attempted abortions. Not surprisingly, the increasing use of ergot for therapeutic purposes was accompanied by numerous reports of its dangers. As the science of organic chemistry advanced during the 19th century it was time to discover the nature of the chemical(s) that were present in ergot and that were responsible for producing its effects. We now know that the active substances in ergot are alkaloids built around the ergoline structure and are biosynthetically derived from the amino acid L-tryptophan.Over 80 different “ergot alkaloids” have been isolated mostly from C.purpura but also from some other closely related species and even a few plants. These alkaloids may be conveniently divided into 3 major structural groups: clavines, lysergic acid amides and peptides (sometimes called ergopeptides or ergopeptines) which contain a tripeptide attached to the central ergoline moiety. Indeed, the ergot fungus is one of the world’s richest sources of pharmacologically active molecules. Many of the alkaloids that occur naturally in ergot have potent biological activity and, additional small changes to their structures that can be made in the laboratory, have resulted in an enormous number of semisynthetic derivatives which are therapeutically useful. 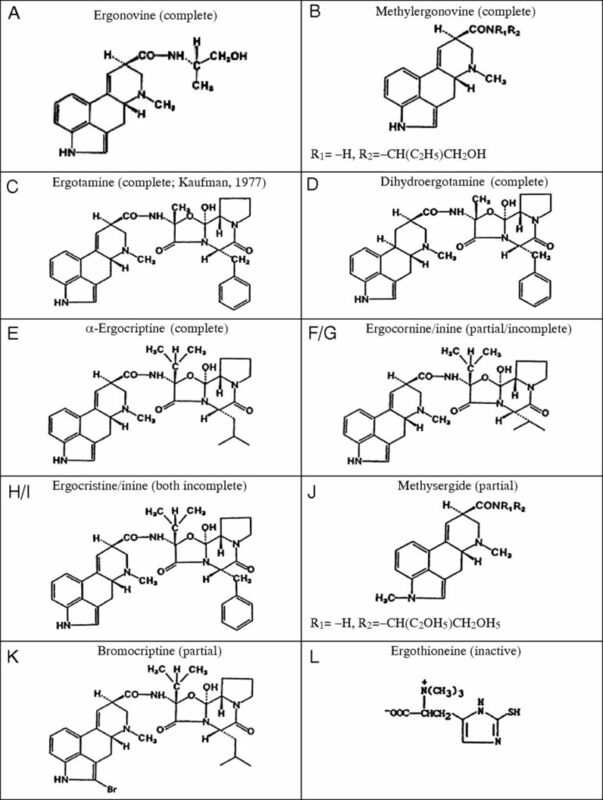 As the pharmacological activities of many of the naturally occurring ergot alkaloids are different -that is, they target different receptors and so produce different effects, it is hardly surprising that when a crude extract is administered the sum total of all of these activities produces the complex syndrome of ergotism. Moreover, because the exact alkaloid content of ergot can change according to growth and weather conditions, the precise effects of each batch may not be exactly the same as any other. After several false starts, the first breakthrough in the isolation of pure ergot alkaloids was made by the Sandoz drug company in Basle, Switzerland in 1917/1918 when Arthur Stoll isolated the molecule ergotamine which was found to mimic the powerful vasoconstricting effects of crude ergot. This led to the suggestion that ergotamine might be useful in the treatment of migraine headaches which are caused by dilation of the cerebral vasculature. This treatment met with immediate success. Ergotamine was vastly more effective than any previously tested treatment for migraine. Indeed, the drug has been used for many years for the treatment of these headaches. Although its use has been generally superseded nowadays, ergotamine is still used in some circumstances. The major problem with the use of ergotamine is that its therapeutic window is not very wide. That is, the dose at which it produces its therapeutic effects and the dose at which it produces dangerous side effects is not that different. Hence, it is very easy to overdose on ergotamine and produce the symptoms of gangrenous ergotism. Ergotamine is a very potent and virtually irreversible vasoconstrictor. Prolonged and excessive vasoconstriction can produce damage to the intimal layer of blood vessels resulting in a clot and associated thrombosis which can be fatal. Although it is a powerful vasoconstrictor, ergotamine’s actions as a uterine stimulant were found to be less marked than crude extracts of ergot indicating that there might be something else in the fungus that was responsible for producing this effect. Several groups of scientists set out to isolate this new molecule including the group of investigators in London led by the great Nobel prize winning pharmacologist Sir Henry Dale. In 1935 Dale’s group isolated a new ergot alkaloid that they named ergometrine. The same substance was isolated a short time later in America and, as usual, the groups on the two sides of the Atlantic could not agree what to call it -so in the USA ergometrine was named, and is still called, ergonovine. The effects of administering this substance were as described by Dale’s colleague John Moir as follows: ‘the onset is sudden, and accompanied by pronounced uterine spasm, which appears to be caused by a succession of contractions so rapid that the organ as a whole has no time to relax. This stage lasts for about 1 h, and is followed by a second stage, during which the uterus shows regular, vigorous, isolated contractions, continuing for one hour or more.” Clearly, then, the ability of ergot extracts to stimulate labor and abortion are likely to be due to ergometrine. It was found that because ergometrine had powerful vasoconstricting effects on the uterine vasculature it could, like crude ergot, also prevent postpartum hemorrhage, a symptom that was often fatal. Hence, from 1935 on, pure preparations of ergometrine were given intravenously or intramuscularly both prophylactically and for treatment of heavy bleeding following childbirth. The prolonged uterine spasm noted by Moir meant that the smooth muscle fibers of the myometrium could act as “living ligatures around the vessels of the placental bed”. The use of ergometrine can be regarded as a revolutionary change in medical practice as these deadly hemorrhages had always been very difficult to treat effectively. Hence, by the mid 1930s the previously toxic ergot extracts had been somewhat tamed producing pure ergotamine and ergometrine (strictly speaking these days methylergometrine), two extremely useful drugs that had revolutionized the treatment of migraine and postpartum hemorrhage respectively. Surprisingly, however, things in the field of ergot research were just beginning to heat up. Ergot Alkaloids. Figure: W. Reuben Kaufman, Jessi L. Minion. J. Exp Bio. 2006. As we have seen Sandoz had a very active and successful program in the medicinal chemistry and pharmacology of ergot derivatives. This continued during the 1930s under the leadership of a young investigator named Albert Hofmann. Hofmann continued to prepare new semisynthetic derivatives of ergot alkaloids, particularly those containing a naturally occurring ergot constituent called lysergic acid. However, he didn’t come up with anything particularly interesting. In 1938 he synthesized a derivative called lysergic acid diethylamide (LSD) but tests in mice didn’t reveal any obvious activity so the new substance was shelved. In 1943, during the Second World War, Hofmann decided to revisit this series of molecules.The rest, as they say, is history and I have discussed these events in a previous blog post. Briefly, what happened was this. Hofmann was working with LSD one morning in his laboratory. As it was during the war, and all private automobiles had been impounded, he bicycled back home for lunch. During his bicycle ride he began to experience some impressive hallucinations. Assuming that he must have ingested a minute amount of the material he had been working on, the next day he took what he assumed to be a small dose of LSD on purpose. As it turns out LSD is a remarkably potent drug and so the dose he ingested was actually rather a robust one. Bicycling home he now experienced a barrage of intense hallucinations and other mind boggling effects which took a considerable time to wear off. Once Hofmann had explained all of this to his initially skeptical superiors (they were skeptical until they tried it for themselves), Sandoz realized that they had come up with something truly unique and attempted to find a place for their new drug in psychiatric medicine in Europe and America. Indeed, for a decade or so LSD was viewed as an extremely promising drug for use in psychiatric treatment. But then in the 1960’s everything changed. People like Timothy Leary and Ken Kesey made LSD a popular recreational drug which played a key role in revolutionizing American society. By 1970 LSD had become completely illegal and fell off the research map until very recently when a revival of interest in hallucinogenic drugs seems to be underway. Nevertheless, the influence of LSD on both science and culture has been enormous. We still aren’t done with ergot! Remember that crude ergot could also prevent lactation in humans and cows? What was responsible for this effect? This question was to produce yet another useful drug. The history of the drug started in Israel. In the 1950s Moses Shelesnyak of the Weizmann Institute of Sciences near Tel Aviv started a series of experiments in rats to find a compound that would prevent the implantation of the ovum. They observed that a somewhat crude preparation from ergot which had been named ‘ergotoxine’ would produce this effect, not by acting at the level of the uterus, but in the hypothalamus of the brain where it inhibited prolactin secretion, an important event in directing subsequent ovum implantation. Scientists at Sandoz extended these observations isolating pure ergot alkaloids and examining their properties. Two of these, ergocryptine and ergocornine, proved to be able to inhibit implantation of the ovum. From this lead, in 1965, the Sandoz chemists created a semisynthetic version of ergocryptine called bromocriptine. Bromocriptine can be used to treat symptoms of hyperprolactinemia including lack of menstrual periods. It can also be used to treat hyperprolactinemia caused by certain types of tumors that produce prolactin which may shrink these tumors. So, ergotamine, ergometrine, LSD and bromocriptine; rather a nice little group of products to have been isolated from ergot for the benefit of the human race. These molecules produce such a widespread group of effects that it is hardly surprising that the symptoms of ergotism are similarly broad. We know quite a bit about how these alkaloids produce their different actions. All the substances we have discussed activate receptors for biogenic amines. Ergotamine and ergonovine primarily target ⍺-adrenergic receptors, LSD activates 5-HT2A receptors and bromocriptine activates dopamine receptors. Indeed, the realization that bromocriptine activates dopamine receptors led to the hope that drugs like ergocriptine might also be used for treating Parkinson’s Disease (PD). To this end Eli Lilly produced the ergot based drug pergolide which has been used for treating PD with some success. Which brings us back to Elizabeth Warleggen. It is clear that the medicine that Elizabeth was seeking in London was something that would act as uterine stimulant and induce early labor-and certainly ergonovine would accomplish this for her. So, it is quite clear that the potion in the bottle she received was an extract of ergot. The apothecary that sold the drug to her obviously knew about its potential dangers and tried to warn her about them. She took the drug and went into labor only to develop a full blown case of ergotism. In particular, she felt cold, had pains in her extremities and exhibited signs of gangrene, presumably because she was susceptible to the effects of the ergotamine that was also present in the extract. As we have seen, such symptoms can be a prelude to death. People like Elizabeth Warleggen who experimented with ergot were really playing with fire. Crude ergot could certainly produce some useful effects but was also extremely powerful and dangerous. It is one of the triumphs of modern chemistry and pharmacology that humans have been able to isolate the active principles from potent crude extracts of plants and other natural sources. 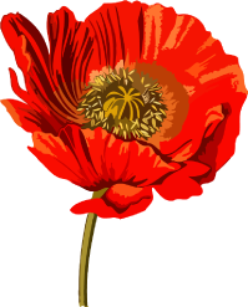 The potential of these things, both real and imagined, as interesting plot devices has been appreciated for years by the writers of fiction -one only needs to think about Wilkie Collins’ plots that revolve around the use of opium. Now, with series like Homecoming, Maniac, Victoria and Poldark, drug driven plots have arrived to take their place in the ever more popular world of the TV series.